I have little or no artistic sense whatsoever, especially in the garden. I tend to plant in rows, in rectangular raised beds, all designed for function, not form. With raised boxes, it's easier to rotate the vegetables each year. IF you can remember what was planted where, the year before. The benefits to crop rotatation? Many of the plants that are in the same "family group" have diseases in common. Many of these diseases are difficult, or impossible, to control using chemicals. For example, don't plant tomatoes in the spot where you had potatoes last year, and vice versa. That could spread late blight disease. The best solution for disease control is crop rotation. Of course, choosing resistant varieties of vegetables can help thwart diseases. For example, tomatoes with a "V" "F" and/or "N" after their names indicates resistance to verticillium wilt, fusarium wilt and nematodes. 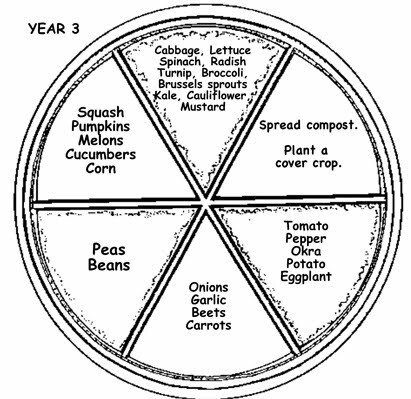 However, most heirloom varieties of vegetables offer little or no disease resistance...another good argument for crop rotation. For heirlooms, choose those varieties that are meant to grow in the area you live. 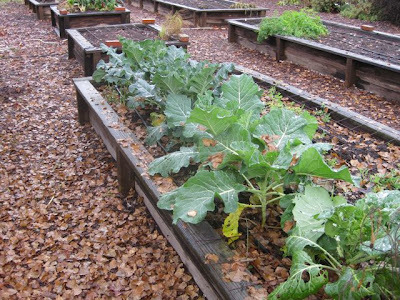 And, it helps to spread an inch or two of compost over all your garden beds before you plant each year. 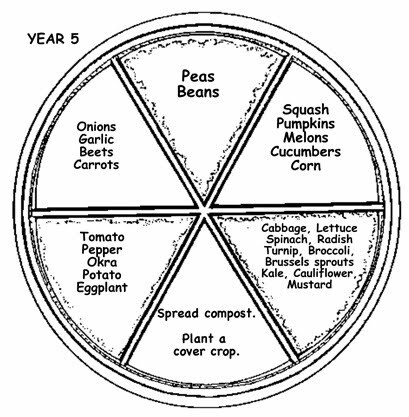 Another reason for crop rotation: to replenish nutrients to the soil. Vegetables tend to be heavy nitrogen users. Giving your soil an "off-year" every few years by planting cover crops allows it a chance to reduce pest populations while building up valuable soil nutrients, as well as beneficial fungi and bacteria. Annual cover crops that do well here in California for the warm weather seasons: buckwheat, cowpeas, soybeans and black eye peas. For the cool weather seasons: bell or fava beans, winter peas, vetch, clover. All of these can add more nitrogen to the soil. Which brings us back to my original quandary...how to remember exactly what was planted where, each year. Garden gnomes (cleverly disguised as possums) steal the signs; leaving crop remnants in each bed could add to pest and disease problems; writing down the location of crops each year would work...if you remember to go back in the house to check your garden notebook before starting the task of planting each year (ha!). 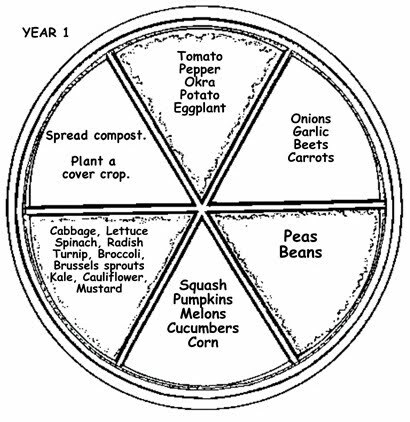 One solution that may work is a circular garden, consisting of six raised beds formed to look like spokes emanating from a hub...a pizza garden, if you will. There are definite benefits to having a garden in the shape of a circle: a central water source in the middle of the circle, perhaps a small tool shed in that hub area, and compacted walkways three or four feet wide (big enough for a wheelbarrow) to avoid stepping on the garden soil. And it just might be an easy way to remember to rotate crops each season. 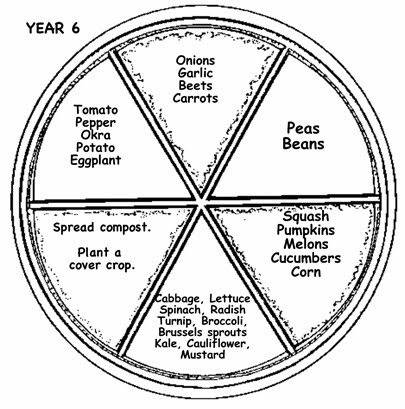 Here's the general idea for the Circular Crop Rotation Garden. 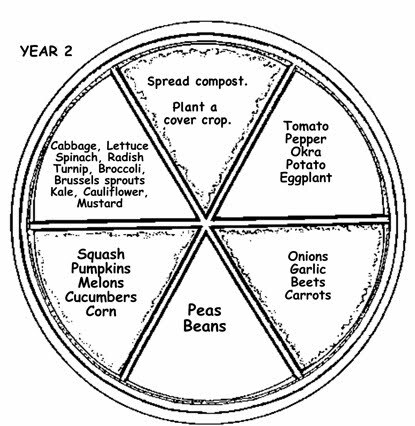 The crops are arranged so that every three years, the soil gets a break: either nitrogen-fixing crops such as peas and beans are planted; or, a cover crop and compost are added to replenish the soil. Also, crops that tend not to be heavy nitrogen users are situated right before the "rest year". In this case, root crops and leafy crops precede beds that are in minimal use (cover crops or peas/beans). The heavy nitrogen-using beds are directly opposite each other: tomatoes, peppers, etc. are opposite the corn and cucurbits. 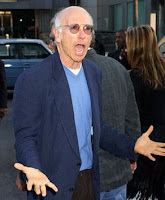 I'm going to use this as a model for my six raised beds. I have 8 rectangular raised beds arranged around a circular bed. My rectangular beds are 4'X 8' so everything is an easy size to work with. I am however working on a plan like yours for rotating crops in my beds. My round garden in the center of it all is an herb garden with a bird bath in the center. I did find the round bed tricky to work in so I divided it into thirds and put stepping stones in it to make it easier to get around in. I've had 2 beds for many years and added 6 more last spring. 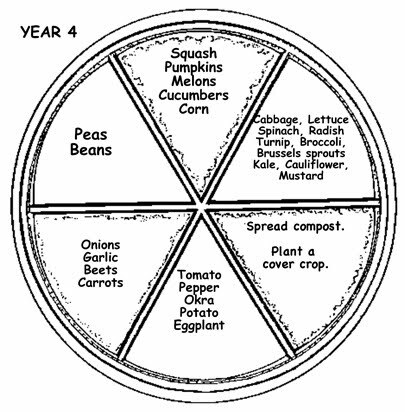 My question is, I've seen many rotation charts speak of years in rotation, don't we change crops with the seasons also? What do I plant after carrots and beets? I can't plant tomatoes in the fall. Should I just skip that and move onto leafy or brassica crops? After a Freeze, What Should a Gardener Do?